As many of you have surely noticed, retro is the new chic. That’s not even a new observation. About a year ago I entered a Best Buy and there were more racks of vinyl records than there were containers of compact discs. Never in my life would I have thought such a thing was possible. The trend of three-dimensional filmmaking, thus far, is what it is: a trend. It began as a fad, in the fad-era of the Fifties, and ended as a fad almost as quickly as it began, and now it’s back. But how long is it going to last? More importantly, what are filmmakers doing to advance the technique? How are we using the technique to advance our visual storytelling, and in turn, advance the art form? While the technical quality of stereoscopic filmmaking has increased, the basic idea has remained the same since the days of Hitchcock’s DIAL M FOR MURDER. Two cameras film the same scene from two slightly different angles, which virtually mimics the way our eyes absorb and translate visual information. In 1954, Hitchcock’s film was projected via two projectors in a theater, and with the aid of 3D glasses, our eyes were directed to the corresponding projected image and the illusion of three dimensions was created. There is also evidence that the way 3D films were presented in the 50’s, thanks to Milton Gunzburg, was superior to the way that they are presented now. Current technology utilizes a beam splitter; ie. one projector projecting two images that merge into one when viewed through polarized glasses. Gunzburg’s “Natural Vision” uses two film projectors, which allows for both images the eye receives to be perfectly in sync with each other. It’s literally frame-for-frame lossless delivery, which eliminates the dimness, lack of fluidity and overall eyestrain we experience while watching contemporary 3D fare. There are only two theaters in the United States that can still project this way: The Film Forum in New York and The Egyptian Theater in Los Angeles. I can understand why this delivery system has gone the way of the Dodo; it’s not cost-effective in the least and if there’s even a slight problem with one of the prints (or digital files) being projected, the other projector can’t save it. The experience is ruined. Because of the inflated ticket prices and inherent gimmicky-ness of modern 3D films, I rarely have a desire to see them. However, I heard Baz Luhrmann intended to shoot his adaptation of THE GREAT GATSBY in 3D as a means of enhancing the drama rather than amplifying the spectacle. I admit, this intrigued me, despite the fact that I am not a Baz Luhrmann fan. I think much of his style is overwrought and it stymies the drama in the material he explores. So, for someone who embraces spectacle with such open arms, I wanted to see him use a technique known only for its spectacle as a means to restrain himself. It’s what Hitchcock was attempting to do in DIAL M FOR MURDER, and it’s what Luhrmann is attempting to do in THE GREAT GATSBY…or so I thought. THE GREAT GATSBY is a spectacle. It is a spectacle that boasts formalistically restrained scenes inside of it. Firstly, the 3D is fantastic; it’s probably the best 3D I’ve seen on the big screen since the effect has been back in vogue. But that’s not an indication of whether the movie is good or bad; it just felt more natural than most 3D movies I’ve seen. I give Luhrmann credit for that. The bigger question is: Does it advance the story? Yes and no. F. Scott Fitzgerald’s seminal novel, “The Great Gatsby,” is filled with subtlety, nuance and social commentary. However, the character of Gatsby is the antithesis of subtle. He is the picture of excess in an era of excess. This theme is reflected in the way Luhrmann chooses to film Gatsby; that is to say, he shoots him in the gloriously excessive, but not necessarily modern, marvel of 3D. Filmmakers who are worth their weight in salt should strive to convey theme through their filmmaking, and Luhrmann does that. 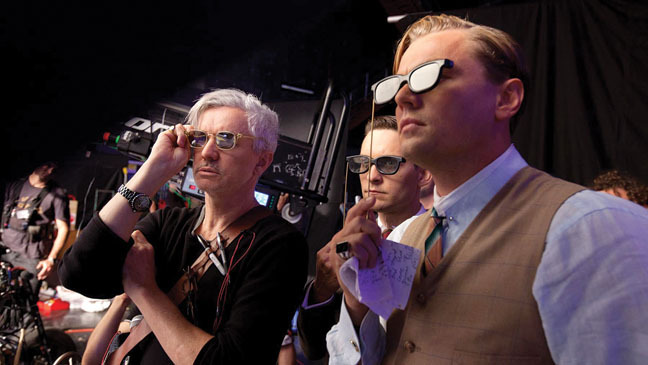 Furthermore, Luhrmann uses a visual technique that increases depth to highlight characters who are, ultimately, found to be shallow. This juxtaposition speaks to the very definition of irony. The problem is that there’s not much beneath the spectacle. As much as Luhrmann would like us to dig through the excess and discover flesh and blood human beings, the shovels we wield can’t seem to penetrate through it. Drama is conflict; we need the realm of the naturalistic world to rear its head and fight against the artificial world of spectacle to keep us invested. Every film, even if it’s a period piece, should reflect the time in which it is made. I had no problem buying the rap music in the soundtrack, even though the film takes place in the Roaring Twenties. However, I have a much harder time buying the stylized acting. I’m a fan of the novel, “The Great Gatsby,” and therefore aware of the affectation that is embodied in Jay Gatsby’s saying: “Old Sport.” In fact, I did not have a single issue with the plethora of times it was uttered by Leonardo DiCaprio throughout the film. It felt, more or less, true to the novel. However, when the artifice begins to dissolve and real people emerge in the story, everything to my eyes and ears is still affected. Tobey Maguire is supposed to be our lens through which we observe the story and empathize with the characters; even if everyone else is portrayed as a caricature, he is supposed to be our set of regular eyes. He is the neutral set of eyes that watches from the billboard. But he is just as affected as everyone else. If we buy Jay Z’s “H To The Izzo” blaring from era-specific cars, why can’t we be trusted to buy the actors talking like normal human beings? Luhrmann’s commitment to depicting life as it was in the 20’s isn’t that much of a commitment at all, that much is clear. When the “greatness” is lifted from the characters, why not lift the veil of artifice completely? If Luhrmann goes to such great lengths to reflect our present day, why does that rubric not extend to the acting? Fitzgerald’s novel explores the horrifying disparity that exists between our expectations and our reality. The green light is, after all, just a green light. If the first half of the film uses three-dimensional technology to contrast the emptiness of the characters, what better way to communicate Fitzgerald’s theme in the latter half of the film than to juxtapose the decrease in 3D spectacle with three-dimensional acting. Unfortunately, I think Luhrmann missed his opportunity, and consequently, missed the mark altogether. Baz Luhrmann’s filmmaking choices aside, I was impressed enough with the hi-tech spectacle not to regret the extra burden it put on my wallet. But, I’m still not convinced that it will ever change the landscape of filmmaking. Until spectators do not have to wear cumbersome glasses and the images appear in front of us via hologram in a darkened theater, three-dimensions in film is still very much at its beta-testing level. In the end, the green light is, after all, just a green light.